Marsh, James H.. "Adam Beck and the Creation of Ontario Hydro". The Canadian Encyclopedia, 25 January 2019, Historica Canada. https://www.thecanadianencyclopedia.ca/en/article/adam-beck-and-the-creation-of-ontario-hydro-feature. Accessed 21 April 2019. "The pure white light generated by God's greatest masterpiece"
At the turn of the twentieth century the hopes of a prosperous future in Ontario focussed on the awesome wonder of Niagara Falls. Waterpower was the "white coal" that would fuel the new economy. Toronto journalist Hector Charlesworth remembered the exhilaration of learning that "a source of energy as vast as the entire soft coal deposits of Pennsylvania had by some miraculous process been transferred to Canadian soil." In 1902, a coal strike in Pennsylvania showed everyone in Ontario the frustration and danger of depending on foreign sources of energy. They looked with anxiety to a cold, oncoming winter. Sir Adam Beck realized Ontario's electric-power capacity and chaired the enterprise that became Ontario Hydro (courtesy Canadian Heritage Gallery). Yes the Falls had to be harnessed, but what impelled one Canadian province, among all the states of North America, to embark on the novel experiment of public ownership? The route that Ontario took had no precedent in Britain or America, but as historian Viv Nelles writes, "was the product of the unique social and political environment of early 20th-century Ontario." And to lead these forces was the imposing figure of Adam Beck. The public power movement began modestly at a meeting in Waterloo, Ontario, on February 11, 1902, where a group of businessmen banded together to discuss creating a combined market for energy. Beck made his debut at a similar meeting in Berlin (Kitchener) in February 1903. Forceful and aggressive in all he did, whether it be tennis, lacrosse, horsemanship or politics, Beck was both mayor of London and a Conservative MLA. He preached the need for cheap, boundless power with an evangelical zeal. For Beck and his supporters, the "civic gospel" was that if a public service was a natural monopoly run for private profit, the result was inevitable: inadequate service and exorbitant rates. Thus began the crusade for the "people's power." Part of the driving force was the complete inadequacy of the private, mostly American owned, power companies, who planned to sell most of the power from the Falls to New York State, leaving only the surplus to Ontario. In 1905 public power entered provincial politics and the new, Conservative premier James Whitney, declared "the waterpowers of Niagara Falls should be as free as air and available...to every citizen." In 1906 Beck's Commission of Inquiry delivered its recommendation for a publicly owned utility. The idea had widespread support. The Toronto World newspaper wrote: "The greatest light that God gave to man is pure white light generated by God's greatest masterpiece - Niagara Falls. Let us keep it forever for all the people." 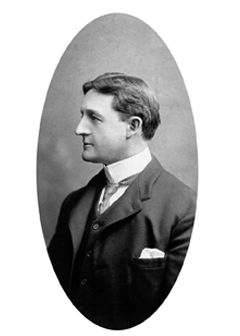 There were formidable obstacles in big business and in the premier's own procrastination, but Adam Beck was the man of the hour. When the publicly owned Hydro-Electric Power Commission went into business in 1910, amid ecstatic celebrations, it was a monument to the energy of Beck. In the contest of interests between finance capitalism on the one side and the consumers of power on the other, Beck was able to persuade the public that the financial and power elite was antagonistic to the welfare of the community as a whole. "Public power was a classic radical democratic cause," writes Viv Nelles, "a defensive measure against one of the more obvious abuses of capitalism." In the classic question, "who speaks for the public good," the answer in Ontario at the turn of the 20th century was clear, Adam Beck. That is always a question worth asking.